Creating an acknowledgement is how a vendor/supplier communicates that the order has been received and the items have been accepted (or not). This information is transmitted to the retailer knows what to expect when the order is ready to ship. Follow these steps to create an acknowledgement. 1. There are two ways to pull up an order that you would like to ship. 2. 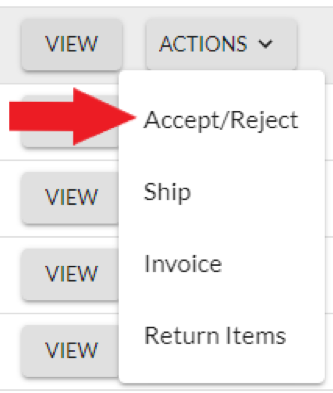 On the Order Management page, click on Actions and select Accept/Reject. 3. You will be taken to the Create Acknowledgement page. This is where you will accept, reject and/or backorder items on an order. 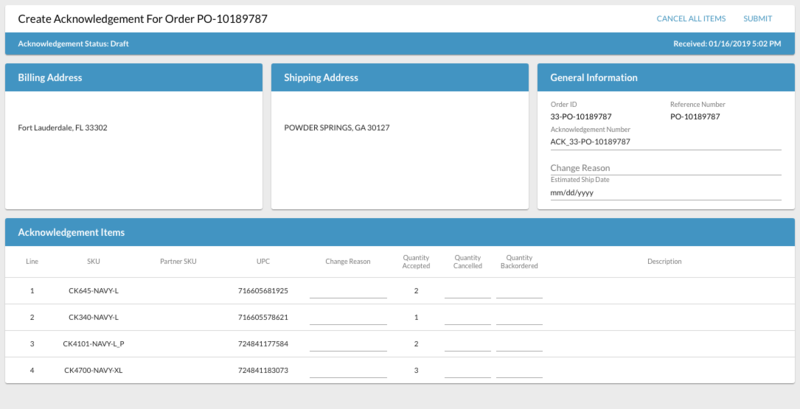 Reference Number (aka Purchase Order Number), which is typically the connecting identifier between all documents. Acknowledgement Number is a unique identifier for each individual acknowledgement file that will be submitted. Logicbroker auto-populates the field but it can be modified as needed. Estimated Ship Date should always be provided when a backorder is being submitted. If there is more than one in stock date due to multiple items being on backorder, select the date furthest out. If you create more than one acknowledgement for an order (example: accept all items initially, then you need to cancel an item), you will need to modify the Acknowledgement Number on the 2nd acknowledgement to ensure it is different than the one created on the 1st acknowledgement. In summary, every acknowledgement should have a unique Acknowledgement Number. All items automatically default to acceptance when an acknowledgement is created. 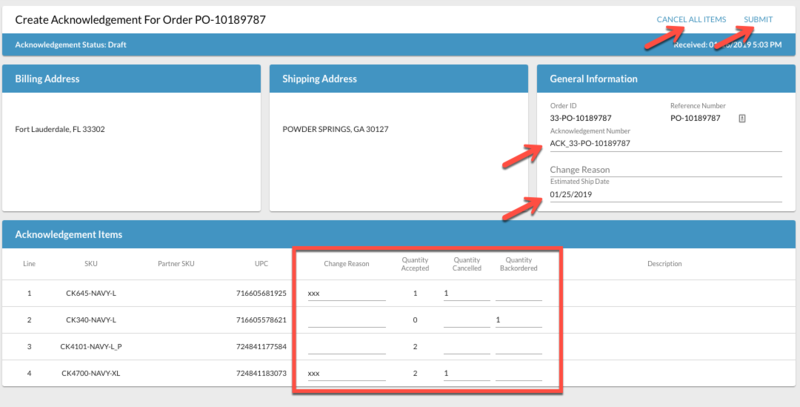 To submit a full acceptance of all items on an order with no changes only requires you to click on Submit (top corner of the page). To cancel items, go to the Acknowledgement Items section and update the Quantity Cancelled field with the quantity you want to cancel/reject for that line. For example, if quantity 2 is ordered and you want to cancel quantity 1, enter quantity 1 in the Quantity Cancelled field. Enter in a cancel reason in the Change Reason field next to each item (just to the left of Quantity Accepted). Click Submit (top right corner of the page) to complete. You may also cancel the entire order without changing any quantities in the Acknowledgement Items section by clicking on Cancel All Items (top right of the screen). To backorder items, go to the Acknowledgement Items section and update the Quantity Backordered field with the quantity you want to backorder for that line. For example, if quantity 2 is ordered and you want to backorder quantity 1, enter quantity 1 in the Quantity Backordered field. Enter in an Estimated Ship Date in the General Information section for the backorder. See example below of an acknowledgement with acceptance, cancels and backorders in one file. IMPORTANT: Because cancel data is sent regularly, make sure your cancellation is 100% accurate before clicking on Submit. The ability fix a mistake is very limited and could have a negative impact on the customer.